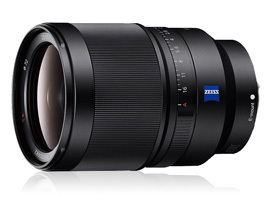 The Sony Carl Zeiss Distagon T* FE 35mm f1.4 ZA (FE 35mm f1.4) isthefirst FE-mount lens to offer a maximum f1.4 aperture, making it a good option for low-light shooting. The aperture ring on the lens barrel has two settings: “with clicks” for still photographers or “smooth” for silent operation during video capture. The FE 35mm f1.4 also offers quiet autofocus performance, thanks to Sony’s DDSSM motor, but there’s no image stabilization available on this wide-angle prime. The FE 35mm f1.4’s aperture blades are of the circular variety to create attractive background bokeh effects, and the lens offers a minimum 12-inch focusing distance for close-up photography. 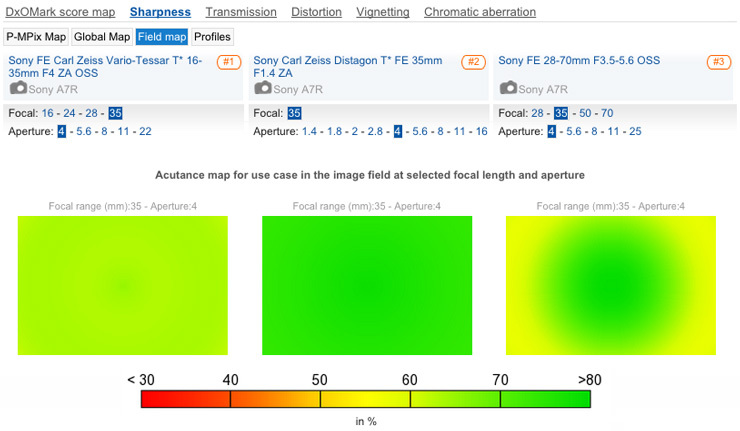 The lens itself is also dust- and moisture-resistant, but as the A7R body isn’t marketed as fully weather-resistant. it’d be wise to exercise some caution in wet or dusty environments. Although the FE 35mm f1.4 is optimized for use on Sony full-frame hybrids, it’s also compatible with such APS-C models as the A5000, where it offers an equivalent 52.5mm focal length. Achieving an overall DxOMark Score of 38, the FE 35mm f1.4 ranks 51st for all lenses tested, putting it towards the top of our lens database. It’s a great result that positions it in second place for all FE-mount lenses, just behind the excellent Sony FE Carl Zeiss Sonnar T* 55mm f1.8 ZA with 42 points. It’s the best FE-mount wide-angle as well, ahead of the Sony FE 28mm f2 and the Sony FE Carl Zeiss Sonnar T* 35mm f2.8 ZA, with 34 and 33 points, respectively. 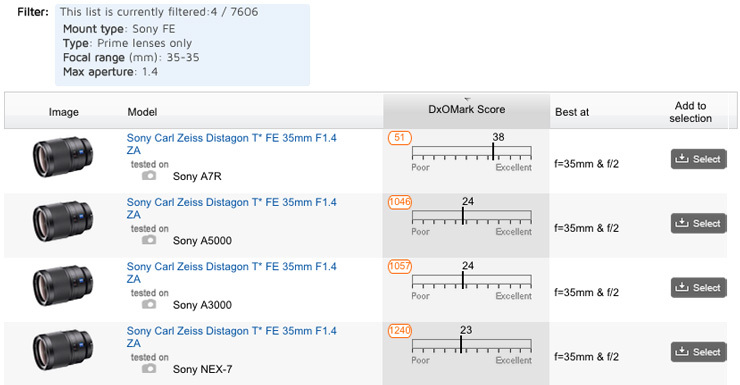 While the outstanding scores are clocked up with the FE 35mm f1.4 attached to a Sony A7R, its performance drops a little on the A5000, where it achieves a score of 24 points. 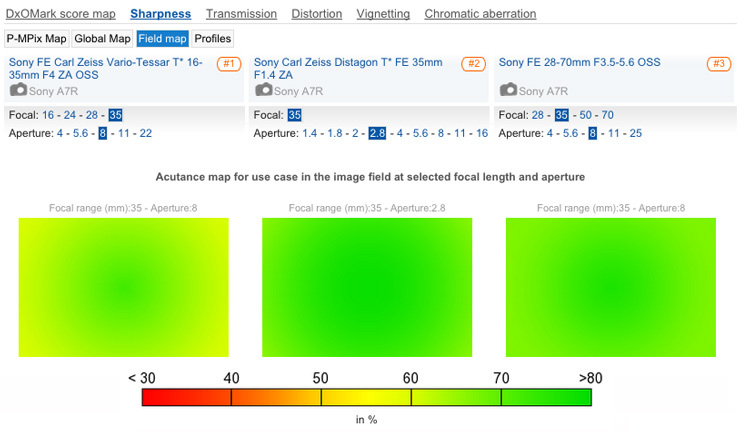 On the A7R, its excellent Sharpness score of 23P-Mpix makes it the third sharpest FE lens, just behind its wide-angle sibling, the FE 28mm f2 with 23P-MPix, and the razor-sharp FE 55mm f1.8 with 29. The advanced optical construction offers excellent resolution at all aperture settings, and although there’s slight edge softness at its widest aperture, f1.4, from f2.8 on it boasts excellent edge-to-edge resolution. 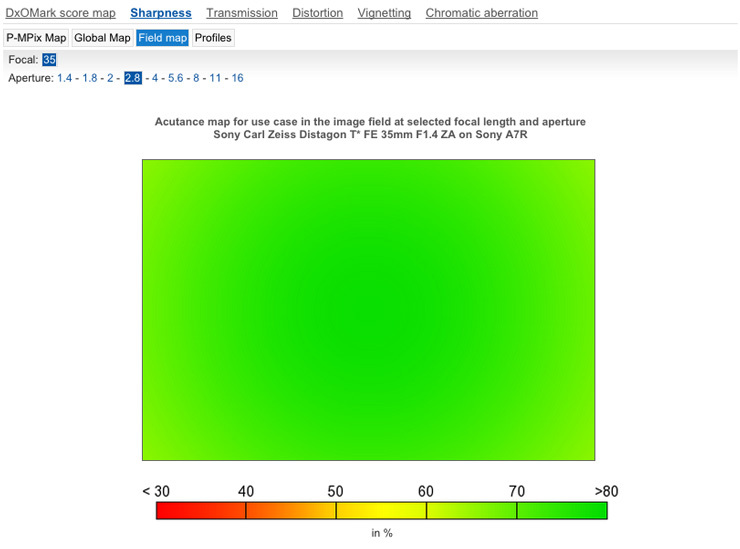 The FE 35mm f1.4’s Transmission score of 1.6TStop is also excellent, and although results for Distortion, Vignetting and Chromatic Aberration aren’t as impressive, they’re very respectable for a wide-angle optic. 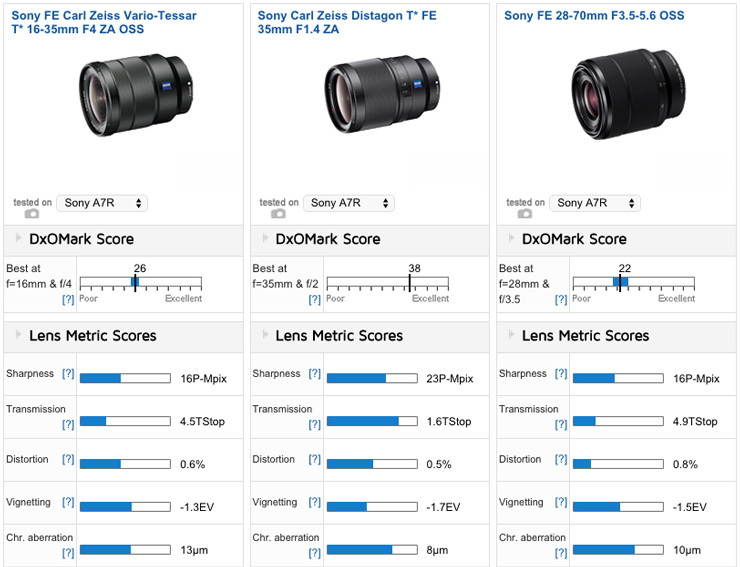 DxOMark Scores for the FE 35mm f1.4 range from a high of 38 tested on the full-frame Sony A7R hybrid down to 24 or 23 on the APS-C format A5000, A3000, and NEX-7 hybrid cameras. 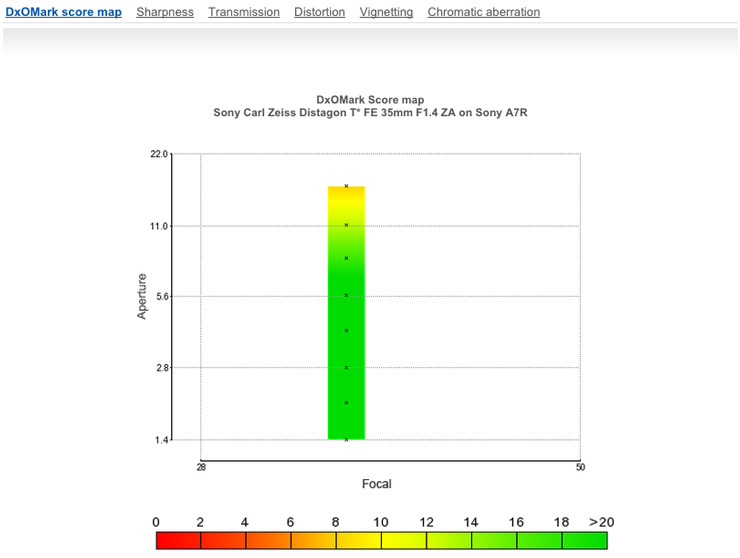 The DxOMark score map for the FE 35mm f1.4 indicates all-round excellent performance up to f11, with solid results at its minimum aperture setting of f16, too. Although sharpness at the maximum f1.4 setting is very good, when you close the aperture down to f/2.8, the FE 35mm f1.4 produces excellent edge-to-edge resolution. An in-depth analysis of the FE 35mm f1.4’s performance against other wide-angle FE-mount primes is available in our FE 28mm f2.8 lens review. So in this review we’ll consider how the FE 35mm f1.4 compares to the performance of the $1,348 FE 16-35mm f4 and the $498 FE 28-70mm f3.5-5.6 zoom lenses that also offer a 35mm focal length. 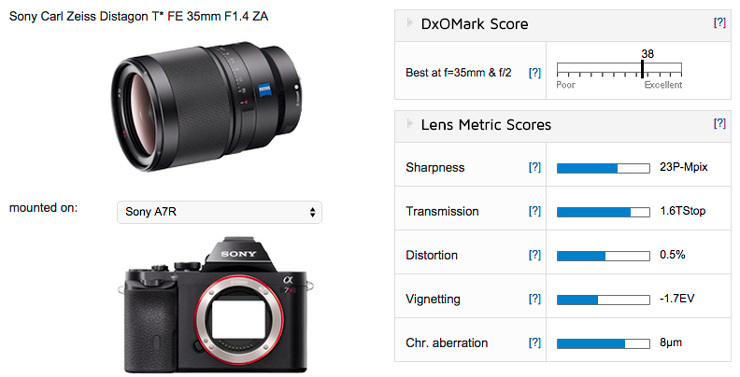 In terms of overall scores, the FE 35mm f1.4 prime is way ahead, with its DxOMark Score of 38 points a big step up from 26 points for the FE 16-35mm f/4 and 22 points for the FE 28-70mm f3.5-5.6. Overall, the prime offers significantly better sharpness, too, with scores of 23P-Mpix compared to 16P-Mpix for the zooms. The prime also offers three stops better Transmission, but its other Lens Metrics results for Distortion, Vignetting and Chromatic Aberration are a little closer. The zooms don’t offer the same “fast” aperture as the FE 35mm f1.4, but at their maximum apertures of f/4 or f/3.5 using a 35mm focal length, the prime offers significantly better sharpness. Sharpness on the FE 16-35mm f4 is homogenous at 35mm f4, but it’s nowhere near as sharp as the FE 35mm f1.4, and although the 28-70mm offers good resolution in the center, there’s some drop off in the corners. Closing down the lens aperture to f8 improves the resolution on the zooms, particularly on the FE 28-70mm f3.5-5.6, but even at this mid-aperture, they’re not as strong as the FE 35mm f1.4 at f2.8. All these FE lenses display minimal distortion, with the zooms displaying some pincushion distortion at 35mm, and the prime barrels a little, but all can be easily corrected in post-production using DxO Optics Pro 10. With the focal length at 35mm using the maximum aperture of f4 on the FE mount zoom lenses, sharpness isn’t as strong or as homogenous as with the 35mm prime at the same setting. In fact, close down the lens aperture on the zooms for their best sharpness at f8, and they’re still not as strong as the FE 35mm 1.4 using a much wider aperture setting of f2.8. Distortion is well-controlled on all three FE lenses, with some minor pincushion distortion on the zooms and barrel distortion on the FE 35mm f1.4 prime easily corrected in post-production. Costing $1,598, the FE 35mm f1.4 certainly fits into the pro category for photographers demanding the best results from the Sony full-frame A7 series. With excellent optical construction, including three aspherical elements, it’s a pretty hefty lens, however, that measures 112mm in length and weighs 630g. If you’re looking for top-quality low-light shooting, you’ll need all that heavy glass, however, and it helps the FE 35mm f1.4 deliver some excellent results. The “fast” f1.4 aperture is great for working in low-light and the 9-bladed circular aperture will create some attractive background bokeh effects, too. Videographers will also appreciate the “stepless” aperture control that prevents unwanted clicks in the sound. Achieving a high DxOMark score of 38 points, the FE 35mm f1.4’s performance is excellent and ranks as the second best FE-mount lens we’ve tested. Sharpness and Transmission results are particularly strong, and with decent results in the other Lens Metric categories, it’s an impressive all-round excellent performance from the FE 35mm f1.4. Sharpness at the maximum f1.4 aperture is very good, but if you can close down a stop or two, then outstanding edge-to-edge sharpness is possible. Cheaper FE-mount zoom lenses that also cover 35mm are available, but they don’t offer anything like the same level of sharpness or that “fast” maximum aperture the pros demand.